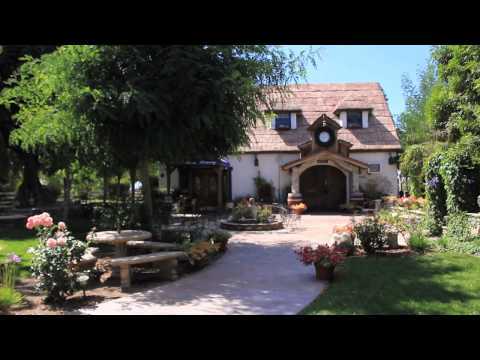 Visiting our family-owned winery you will step into an enchanting storybook setting. Enjoy the 'Taste of Enchantment' of our premium wines, in a tranquil setting while relaxing with our gnomes under the shade of one of the oldest olive trees in Southern California. Briar Rose Winery is off the path of the wine trails among the rolling hills, originally designed by Beldon Fields who assisted in creating Disneyland in the 1950's. The property was purchased by the Linkogle's in 1980's as a gift from Les to his wife Dorian. The property is host to a life-size replica of Grimm's Brothers Snow White's Cottage. Owners Dorian and Les Linkogle invite you to a wine tasting experience with their award-winning wines. Your personalized wine experience begins with a sit-down table service in our Old World tasting room with your personal wine associate. Les has a passion for making premium wines; his process begins with good vineyard work and harvesting of healthy, ripe grapes. The grapes are handpicked before crushing; only the finest grapes will go into a bottle of Briar Rose. Our reds include an inspiring collection; led by our signature superstars - Cabernet Sauvignon and Zinfandel. Other reds include Petit Verdot, Cabernet Franc, Super Tuscan and Sangiovese. Our white wines superstars are Viognier and Gewurztraminer. Experience the soul and harmony of our Riesling, Fume Blanc and Chardonnay. Some innovated and fun wines are Citronier a blend of Viognier with Meyer lemon zest. Try our wine lager; Talking Frog; a blend of Viognier and lager Hefeweizen. For information and to make a reservation to begin your table service wine tasting experience, please call us at 951-308-1098. Reservations required - same day available. Hours: Open Thursday through Monday from 11a-5p. Temecula's first Reservation Only Winery featuring seated tasting. Reservations required - same day available.